Boubouille from MMO-Champion has recently posted this "leaked" screenshot of Kil'jaeden in-game. 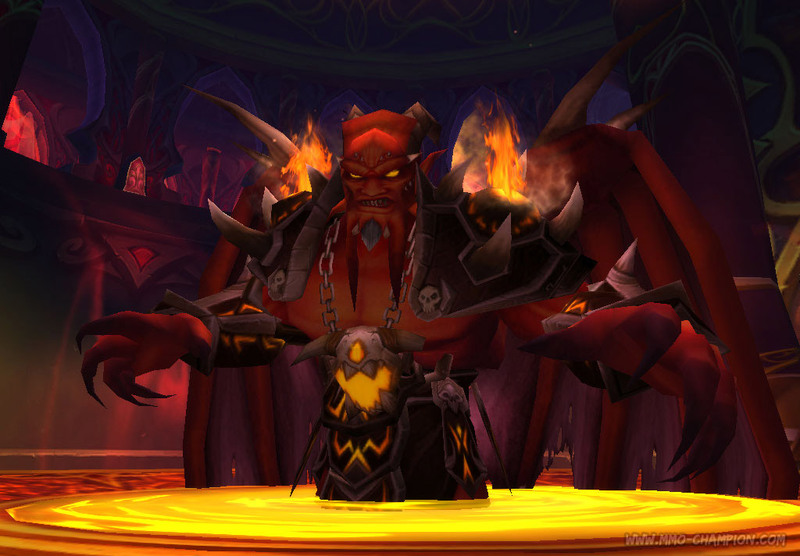 According to the sender, this shot of Sunwell Plateau's final boss was leaked from a GM. "Keep in mind that it could be a fake, it's not "that" hard to get the 2.4 running on an emulated server and spawn Kil'jaeden, in this case his scale on live servers could be different," warns Boubouille. Kil'jaeden the Deceiver, as we all know, is the eredar Supreme Commander of the Burning Legion, perhaps only second to Sargeras in the badass pecking order. With his appearance in-game and a chance for 25 intrepid mortals to "take him down", the lore implications are interesting. Granted, we only get to deal with "half" of him (the rest of him is submerged in the Sunwell), but lore-inclined raiders will certainly be itching to take a shot at him, at least until Arthas/Ner'Zhul/the Lich King makes an appearance in WoTLK. I'm not certain of the authenticity of the screenshot myself, but Killie definitely looks constipated and evil enough here to be the real deal. Tickets for the Blizzard Worldwide Invitational, being held this year in Paris, France, are now on sale according to the official website. The event, taking place on June 28th and 29th, promises to be a big one. Not only will there be invitational tournaments, but you can expect developer panels, auctions, loot galore, and the thing we're most looking forward, playable versions of Wrath of the Lich King and Starcraft 2. If you have any chance of being able to make it out to the City of Lights this summer, we'd strongly recommend buying a ticket, it sounds like it's going to be a blast for Blizzard fans, whether competitive tournament play is your thing or not. We'd also recommend staying tuned to WoW Insider for all the latest information on this event and the Wrath of the Lich King expansion! Susana of Hyjal speculates about something I've thought about a few times before -- just what exactly are Blizzard's internal development tools like? Most games that have mapmakers can churn out new maps pretty rapidly, but we've had the same BG maps for years now, and only one or two per year since then. And even the created maps aren't fixed easily, apparently -- a few map tweaks on WSG would probably fix the turtling problem, but Blizzard instead is tweaking the rules to fix things. Just what is Blizzard using to make their game that they take so long with development? To be fair, the rules here are a little more complicated than most first-person shooters (since you can do a lot more than just shoot at each other), so obviously the maps would presumably be a little more complicated as well. But in the age when players have access to the Neverwinter Nights toolset and even the Forge on Halo 3, surely it's a little crazy that Blizzard takes months to release one map, when other great games can pump out whole packs of them in the same time. Now, this is WoW Insider, so it's ok if you're a Blizzard apologist. It's fine for you to say "Blizzard has the biggest game in the world not despite the fact that they're so slow, but because of it," and it's fine for you to be a fanboy/girl and say you'd rather wait three years for a Blizzard-quality Arathi Basin than play a whole "Hidden Fronts" pack. And the truth is that when Blizzard does release content, they don't disappoint. But we're still left wondering just why, after doing this for so long and having so much practice at it, it still takes them so long to do it. Just had to share this amazing "Tree of Life" wallpaper with you all, as seen on Resto4Life. It was commissioned by them, and done by Andrige, an artist who's created quite a few terrific WoW-related images. But man this is a great piece of work from start to finish, with a little Night Elf treeform backed up by the big Ancients in the background, all covered with that great purple Darnassian glow. Very cool stuff, and very apt to grace the desktop of any Resto druids out there (or the people who appreciate them -- raises hand). My only complaint is that it's all druid centric -- where are my epic Shaman wallpapers? It is time for Totem Talk to talk about totems, and the shamans who drop them, in PvP. Matthew Rossi takes his resto and enhancement shamans into PvP from time to time... the resto heals until someone decides to kill him, and then he dies because his teammates are ten yards away and could care less about him dying until they start yelling for heals while he sits in the graveyard back at the farm, which is why he prefers to play the enhancement shaman. Healing people hurts. PvP is a sensitive subject among some shamans. Elemental shamans basically PvP with a specific talent build that allows them a large burst of damage up front (so specific that it was nearly nerfed, which would have gutted elemental as a PvP build), enhancement shamans have been complaining of mobility and dispelling issues with their abilities for some time (leading up to some as yet still intended changes for the spec in 2.4) and resto shamans heal things and get killed for it. Luckily, they've reduced the mana cost on Earth Shield, so that when it gets spell stolen or dispelled it won't cost as much mana. To a degree, I feel like any shaman PvP discussion started by me should be titled "Don't do the things I've done". Don't go into AB and try and defend a flag solo as resto. Don't sign up for an arena team consisting of an enhancement shaman, a fury warrior and a mage. But we can probably cover all of that under the headline "Don't do anything really, really stupid" and move on from there. It's amazing how often I can use my life and my decisions to warn other people. Amazing and a touch disheartening, but at least we can all point and laugh at me together. But before we do that, the lovely folks at The Bronze Kettle linked to this site, which is all about the trails and tribulations of a person multiboxing an elemental shaman arena team. So it seemed relevant to link it here, too. How much would you pay to be guaranteed a Zul'Aman bear mount? Five thousand gold? Ten thousand? If you're Kharmen from the European realm of Talnivarr, you reportedly paid twice that -- according to the forum thread, Kharmen paid 20,000 gold to the guild Torment to take her into Zul'Aman and get her a bear mount from the timed event rewards. As some players in the thread are saying, the mount isn't actually that hard to get, and in fact, many guilds who can raid fast enough to get it will sell it off for much less. But the more interesting story here is just the sheer amount of money involved. Kharmen says that she farmed the money herself, which may be true, but it seems surprising that players can pass that much money around without raising some eyebrows at Blizzard. Just what does it take to become a suspected gold farmer? At any rate, Kharmen is thrilled that she got her mount, and supposedly Torment is thrilled that they're funded at least until the expansion (unless I'm completely miscalculating the amount it takes to keep a guild raiding -- just how much money do you need for elixirs and buffs these days?). Spending 20,000 on a mount doesn't sound like anything I'll be doing anytime soon, but then raising all of that money doesn't sound that appetizing either. Every Thursday, Well Fed Buff serves up the tastiest dishes to boost your HP and stats, just in time for your weekend gaming. When I first saw Deep Fried Plantains drop from a mob, I immediately thought to myself: banana-cue! Pronounced 'banana queue', as in "barbecue" or "I wanna queue up at the Battlemaster," this simple delicacy is a popular street food in the Philippines, usually skewered with sticks made from bamboo. Kind of like banana kebabs. They're really simple to prepare... probably the simplest of all Well Fed Buffs so far, so even those who have a low cooking skill should be able to prepare them. You can use this recipe to raise your cooking skill, so you can tackle more complex recipes like Winter's Veil Bark or Dragonbreath Chili. A few more instructions and gratuitous pictures after the jump. "Are you sure you want to do this? Really?" In last week's lecture we discussed factions and reputations an Engineer might find beneficial for their career progression. In that lecture, it was mentioned that the only real decision to be made for an Engineer is between the Goblin Engineering school, known as the Goblin Experimental Engineering Korporation, or the Gnomish school, known as the Mechanical Engineering Guild, Associated. Making this choice is an important step in the career paths of many Engineers. It involves a lifelong oath of loyalty, a considerable investment of time and resources, and it steers the direction your tinkering will take for the rest of your career. Well, almost. One can renounce one's affiliation with M.E.G.A. or G.E.E.K. but at a cost. Perhaps a cost too terrible to bear for many Engineers. The life expectancy of an Engineer is short, and thus his lifelong loyalty can be considered a less than permanent thing. Even so, the memory of an Engineer is long, and it is no simple task to convince those who were once your sworn (and "lifelong") rivals that you are now their sworn (and "lifelong") ally. You should know before you even consider this the drawbacks involved. Other professions allow a change of specialization with relative ease and minor expense. It is, for many of them, simply a matter of purchasing a new school. They are not like the Engineers, though. The Dragonscale leatherworkers are not foes of Elemental leatherworkers, not to the same degree as are Gnomish and Goblin Engineers. For the Engineer a sacrifice must be made, in order to demonstrate to your prospective new associates that your intentions are good, and your commitment to them firm. Herein we will discuss the method of changing one's specialization within Engineering. The upcoming patch, patch 2.4, now known as The Fury of the Sunwell, revolves around... well, the Sunwell! I guess there's something in there about a huge demon by the name of Kil'jaeden, but I'm sure he's not important. Like my previous installments of Know Your Lore, I'll give a little bit of background information on our subject, so you understand the foundation of it. This bit isn't quite as exciting as my last installment or two, but this took a lot more research, and a lot more piecing together half-told bits of story from multiple authors. It's a bit like playing Connect the Dots, but instead of getting a flower or a sailboat, I get Richard Knaak flipping me off. Sorry it's so dry, but on with the show! A little over 10,000 years ago, the Night Elves lived under the rule of Queen Azshara and the upper class of society, the Highborne. Their culture was rich in magic and the arcane, very different from the down to earth, nature-centric society of the Night Elves today. Queen Azshara and her Highborne were extremely hedonistic, using the nearby Well of Eternity for personal power and gain. At some point during all of this, Azshara heard a dark whisper, promising power beyond her imagination. Does this sound familiar? Yes, Sargeras was up to his old tricks again. Like he lured Kil'jaeden and Archimonde to the Legion's cause, he did the same with Queen Azshara. Whereas Kil'jaeden and Archimonde seemed to have needed a little trickery from the Destroyer, Azshara was far more welcoming. She was pretty okay with hanging out with demons, and rather enjoyed the whole fire and brimstone thing. It looks like celebrities are unofficially joining in on the parody commercials. Vic Mignogna, best known as the voice of Edward Elric on the anime series, Full Metal Alchemist, is the latest to participate. Vic's inner WoW player turns out to be a warlock. He uses his theatrical voice and flare to present his story to the audience, even hinting at his ability to do alchemy. Now that this is out of the way, I can only hope that the Blizzard commercial spoof trend dies down. It's so three months ago! In Blizzard's attempts to get rid of gold farmers and hackers, one of their most annoyingly persistent enemies has been the WoWGlider bot, now known as MMOGlider. They've been throwing suits and countersuits at each other for a few years now, but the latest salvo seems to have gone against Blizzard, the Game Activist reports. Blizzard was trying to subpoena Joe Thaler, owner of Lavish Software LLC, maker of programs such as EQPlayNice. While Lavish Software's programs do not appear to be cheat programs on their own, they did make a deal with MDY Industries, maker of MMOGlider, to use the programs within MMOGlider. According the judge's decision, Blizzard was hoping to obtain all documentation related to the deal, all communication between Thaler and Lavish and MDY and its owner, Michael Donnelly. They also wanted a list of all WoW accounts owned by Thaler and Lavish, as well as the contents of the WTF folders of every installation of WOW used by Thaler and Lavish Entertainment. Unfortunately, the Judge ruled that Blizzard was demanding information that could compromise Lavish's trade secrets and client confidentiality, and that the demand for the information within 9 days did not give Thaler and Lavish enough time to respond an gather information. It's worth noting that the judge did specifically say that Blizzard could file another subpoena that would be more narrow in scope and allow more time for Lavish and Mr. Thaler to respond, so this is probably not a fatal blow to Blizzard by any means. I personally hope not. I've never had much patience for bots, or people who feel they have a civil right to cheat at games, so I'm rooting for the big bad corporation on this one. What about you? Thanks for the link, Tyrsenus. One of the biggest challenges for new rogues is figuring out the combo points/finishing move system. Sure, the combo points are easy, even though they really don't rely on "combos" per se. You hit stuff with your main move and get points. Any human, great ape, or intelligent robot could do it. But without an understanding of finishing moves, your target will die with five combo points on him and you will curse yourself for ever getting involved in this soul-sucking game. What it is: Your first finisher, and if you're like most rogues, probably your favorite. This most basic of spells does direct physical damage based on how many combo points you have. Eviscerate = (Base Damage Minimum + Attack Power * (Number of Combo Points used * 0.03)) - (Base Damage Maximum + Attack Power * (Number of Combo Points used * 0.03)). Yeah, I'm bad at math too. So what does this mean? Well, starting in 1.12, Evis finally began scaling with AP (a change many rogues were clamoring for.) But it scales very slightly -- and the more combo points you have, the better it scales, since the AP multiplier increases with each point. Affected by: Improved Eviscerate, a first-tier Assassination talent, improves Evis's damage by 5/10/15%. Aggression, a sixth-tier Combat talent, improves it by 2/4/6%, along with SS and Backstab. The two-piece bonus of Tier 5 armor increases Evis's damage by 40 per combo point. Analysis: Sinister Strike/Eviscerate is the bread and butter of rogue leveling, particularly for combat swords/maces/fists rogues who don't spend a lot of time stunning. It's also great for grinding and finishing off opponents who have low health. However, when it comes to raiding, Evis is nearly useless. Unless the mob can't bleed (like in Kara), Rupture will always end up doing more damage than Evis, assuming the mob doesn't die before Rupture finishes ticking. Continue reading Encrypted Text: Finish him! Player Naraki of the Battle Royale guild on Trollbane decided to have a little fun on a trip to the Scarlet Monastery. Apparently these racks can be used for more than torturing the unclean. They're also good for taking a quick snooze. Do you have any unusual World of Warcraft images that are just collecting dust in your screenshots folder? Because we'd love to see it on Around Azeroth! Sharing your screenshot is as simple as e-mailing aroundazeroth@wowinsider.com with a copy of your shot and a brief explanation of the scene. You could be featured here next! Remember to include your player name, server and/or guild if you want it mentioned. We prefer full screen shots without the UI showing. And please, no more sunsets. This means you. I'm not kidding, yours is not the exception. No, really. Sigh. Rumor has it that the record for leveling from one to seventy has been broken yet again. Tosog of EU Kil'jaeden has reportedly maxed out in one day, four hours, and twenty-nine minutes. This was posted in a thread where Athene boasted a (NSFW) new video (NSFW) on how he went from 1 to 70 in 1 day 19 hours 39 minutes. Roadkillowns of Aerie Peak posed the question on the official forums, what is the easiest class to level? Hunter came up most frequently as an easy class to level followed by Warlocks. They usually have very little downtime. Protection Warriors and Holy Priests were often quoted as the most difficult to level. Having leveled a Shaman, Paladin, Hunter, Priest, and Druid to level seventy myself I have to say that as a solo character, the Hunter was hands-down the easiest for me. Between my pet carrying agro for me and the glorious Feign Death ability, I was always good to go. Good evening ladies and gentlemen (cue the WoW Insider Show intro music). For tonight's entertainment, I present to you a fully functional PTR - complete with Sunwell Plateau and lots of goodies to play around with. Well, at least it's evening if you're up with me at 3:00 a.m. when I'm posting this. But even if you're not a night owl, now is probably your last chance to head over to the PTR and test out all the goodness that is patch 2.4. Blizzard had shut it down until now, possibly to just test out one or two other things before releasing the patch soon. My bet is still on March 25th. I have no little birdie in my ear saying that's a for sure thing, but I just have this gut feeling I'm right. If you've participated in the guess the release date contest, you might be under a week away from winning a nice 60 day game card. Drysc posted yesterday to tell us a bit about what will be forthcoming when Season 4 hits the servers. It's honestly mostly stuff we knew already. Season 4 will not begin immediately upon the release of 2.4. Season 1 will go the way of the old level 70 honor gear and disappear from vendors, Season 2 will be gained via honor, and season 3 will go down in price, while still keeping the personal rating requirement to purchase the shoulders and weapon. However, the surprising little tidbit is how little they currently plan to change the requirement. Drysc quoted a requirement of 1950 for the shoulders and 1800 for the weapon. That's a total drop of only 50 points for each item. Of course, he also stressed that this information was not final, and neither the final requirement drop on season 3 nor the start date of Season 4 had been announced yet. There is some concern from some comers that that drop is possibly a bit too low. Drysc responded to one player's voicing of those concerns with a somewhat cryptic reply that he thought they were making a few too many assumptions. I'm not quite sure what he could mean by this. I myself can't imagine a team that would climb to 1800 rating and simply satisfy themselves with season 3 weapons when they could make one last push to season 4 rating, so to me, the confusion is justified. Perhaps Drysc is hinting at a mechanics change in the way arena rating is calculated, or the fact that his numbers could easily change themselves? Perhaps he simply means that Blizzard is actively trying to shake the "welfare epics" stigma, and that people shouldn't assume they're entitled to low requirement ratings on the season 3 gear. I'd tend to lean towards that last one myself. What do you think? Are these numbers too high? Are you expecting Blizzard to change them? Or do you applaud this as a step away from making Arena gear a welfare system for those who can't or won't raid or save badges? The Gnomes are revolting on the official forums! Also, some of them are mad. Lead by Gnomium of the Aggramar server, they are demanding that they be included in the opening cinematic for WoTLK. It is certainly true that they haven't really had their chance in the sun for the past 2 major cinematics, although to be fair, the Trolls didn't get much more than a quick flash across the screen. Still, I can get behind this, and not just because I like my ankles non-bitten. Give them some Gnomish love, eh Blizzard? Maybe even let one use an engineering trinket without backfiring! Or, you know, just give us a tableau of Lake Wintergrasp with Gnomes being loaded into catapults and flung at the advancing Horde, either way. Of course, we can't really have the WoTLK Cinematic be all Gnome all the time, so how do they fill the rest of it? I have to say, there's potential here. We'll probably need a massive army of Scourge, seething masses of ghouls dotted with the odd abomination or meat wagon. Perhaps we could see a group of adventurers descending into Azjol-Nerub only to be set upon by a platoon of vicious Nerubians. For the amazingly, unbelievably epic win, we could even feature a Blue Dragon vs. Red Dragon battle, since apparently Alexstraza herself will be helping us stop Malygos' mad plans to control all magic in the world. We'll probably also need at least one or two scenes of a "rebel" Death Knight fighting the scourge or breaking free of Arthas' control. What do you think? What other scenes would you like to see in assuredly soon-to-be-released (We hope) FMV cinematic for WoTLK? When I first decided to roll a Paladin, I had no interest in healing or tanking. I rolled one back in the days before Burning Crusade, back in the heyday of the Reck Bomb. The idea of having what seemed essentially like a Warrior who had access to spells and could self-heal was extremely enticing. I've also had a fascination with the Paladin ever since I played Final Fantasy IV (released here in the States as Final Fantasy II). I've had a Paladin in every game I ever played where it was possible to have one. I used paladins to great effect when I played Warcraft 2, and as anyone who's ever played Warcraft 3 can tell you, paladins were central to the story (Arthas Menethil, better known these days as The Lich King, started out as a Paladin of the Silver Hand under Uther the Lightbringer, the original Paladin). Oddly enough, when I started playing WoW back in June of 2005, my first character wasn't a Paladin (I rolled Horde, and thus couldn't). However, as soon as I started playing as Alliance on a different server, I created one immediately. Between Arenas, V'Ming spends his time as a lock laughing ominously in AV, tanking Olm with his own minions and pondering troll fashion from Zul'Aman. He's recently started to plumb the depths of SSC with his 0/21/40 build and bragging about 8k shadow bolts. The internet is a beautiful thing. It gives everybody a voice and an easily accessible goldmine of human ingenuity and intelligence. (It is also a repository of human scum and stupidity, but we're not going there today.) As a warlock player, there are TONS of resources out there that you can use to improve your game. Unfortunately many of these resources are scattered far and wide - and it takes a certain deftness with search engines to separate the wheat from the chaff, or simply to find what fits your playstyle. So, for the benefit of the newly initiated and the time-challenged, I'll start and maintain this list of tried and tested Warlock tips, from the frivolous to the essential. I will not claim credit for these tips, but humbly serve as the chronicler of community content in this case, and will give due credit wherever possible. If you have pet tips that you swear by as a Warlock, please feel free to share them - and I'll add it to this list after the jump.